Seeing Halle Berry and Julia Roberts types gracing myriad magazine covers sends us the (gratefully received) message that we can still be glamorous and vibrant at age 40 and beyond. But the truth is, when it comes to our eggs, 40 is not the new 30. Fertility studies report that a woman’s chances of having a baby decrease rapidly every year after age 30. Many women turn to fertility treatments for help when pregnancy seems elusive. While infertility issues can be related to age, other health problems, such as blocked fallopian tubes or endometriosis, can also affect a woman’s ability to have a baby. In vitro fertilization (IVF) is one popular method used to treat infertility. 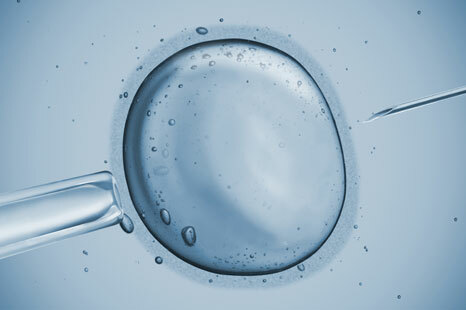 In an IVF procedure, eggs are removed from a woman’s ovaries and fertilized by sperm in a lab. After that, one or more fertilized eggs (embryos) are transferred into the uterus. The odds against IVF leading to a successful pregnancy become much greater after the age of about 42, says Dr. Nancy Klein, IVF director for Seattle Reproductive Medicine. Women struggling with these odds sometimes turn to egg donation, because for this age group, the success rates are significantly higher than with traditional IVF. Young women can also suffer from poor egg supply. Rachel (she asked to not be identified) was in her late 20s and trying to get pregnant when she became concerned because she hadn’t had a period for more than a year. She was diagnosed with premature ovarian failure. “I had no eggs,” she says. “Every woman is born with a certain number of eggs, and as time progresses, they die. Mine happened to die off sooner than later.” Rachel was told that the only way she would conceive was by using a donor egg. When a woman opts for egg donation, she begins by choosing a donor. The egg donor can be someone she knows, such as a family member or friend, or can be selected anonymously through a clinic. The donor and the recipient of the eggs take hormonal medications to “synchronize their cycles.” This prepares the donor’s ovaries to produce eggs and ensures that the recipient’s uterus will be at the right phase to accept the eggs once they are fertilized. Once the cycles are synchronized, the eggs are retrieved using a needle, which goes through the vaginal wall and into the donor’s ovary. The eggs are then fertilized in a laboratory with sperm from the male partner or sperm donor. The embryos are evaluated and the strongest ones are selected to transfer into the recipient’s uterus, which is done with a thin tube. Unused embryos can be frozen and stored (cryopreserved) and thawed later for another attempt at pregnancy. A new method of freezing eggs called vitrification is one of the latest advances in reproductive medicine. The American Society for Reproductive Medicine lifted vitrification’s “experimental” label in 2012, after several clinical trials found that IVF pregnancy rates between frozen eggs and fresh eggs were comparable, with no increase in birth defects. With this method, frozen eggs are stored in an egg bank and thawed when needed. In addition to helping those with infertility, vitrification offers hope to young patients undergoing cancer treatment by preserving their eggs for later use. Rachel and her husband decided to go with frozen donor eggs for convenience — and because the cost was significantly lower than using fresh donor eggs. Through the egg bank, they were allowed to see the donor’s family health history, achievements and photographs. They decided to go with a donor they felt had similar characteristics to Rachel. The pregnancy was successful, and in February, Rachel gave birth to twins, a boy and a girl. Women often find it hard to accept that their child will not be genetically related to them, says Eileen Stein, a Seattle-area clinical social worker who specializes in infertility. Stein has struggled with infertility herself. “It’s a difficult journey. It’s our nature to want to conceive of our own genetics, so people have to emotionally wrap around it and give themselves some space to grieve.” It often helps women, she says, to focus more on their nurturing role in the pregnancy and as a parent, and less on genetics. The frozen embryos that are left over from IVF procedures often present a dilemma for couples, says Stein. Many people are uncomfortable with discarding the embryos or with donating them for research. Many infertility clinics now offer patients the option of donating their frozen embryos to others who are struggling with infertility. After giving birth to her daughter through traditional IVF, Stein decided to donate her unused embryos. It was important to her to find just the right couple, and she says that for her, it was very much like an adoption. When Stephanie Lipp gave birth to twins through traditional IVF in 2004, 12 embryos remained. The embryos were cryopreserved, and Lipp still feels attached to them. “It didn’t really sink in for me until the morning of my implantation, when they showed me pictures of my little eight-cell organisms. Those were the first pictures of my babies.” She and her husband still haven’t settled on what they are comfortable with when it comes to the fate of their embryos. Assisted Reproductive Technology, CDC: For national pregnancy success rates, as well as detailed information on the success rates of fertility centers across the country visit this part of the Centers for Disease Control and Prevention website. Society of Assisted Reproductive Technology: For information about egg donation, egg banks, embryo donation and other ART procedures. Resolve, National Infertility Association: For help seeking emotional support during the journey through infertility.